Another weekend and we have been plugging away, one strip at a time. We had Thirteen strips on and we have put on a strip every day or so and today we are putting on the Seventeenth. Where we left off…Thirteen strips on. The Fourteen Strip is going on next. Tape at the North Stem. 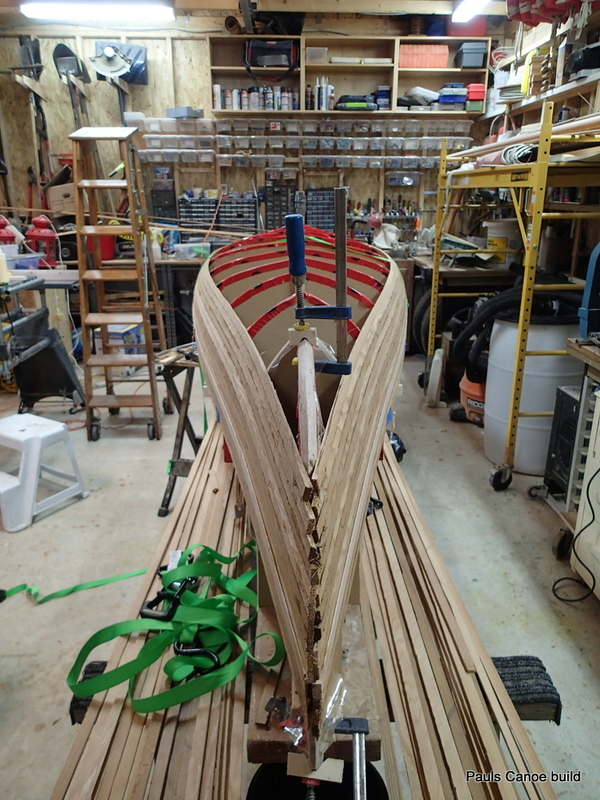 We put on the Fourteenth Strip and the next day, with all the tape off, we get a good look at the shape of the Canoe!! 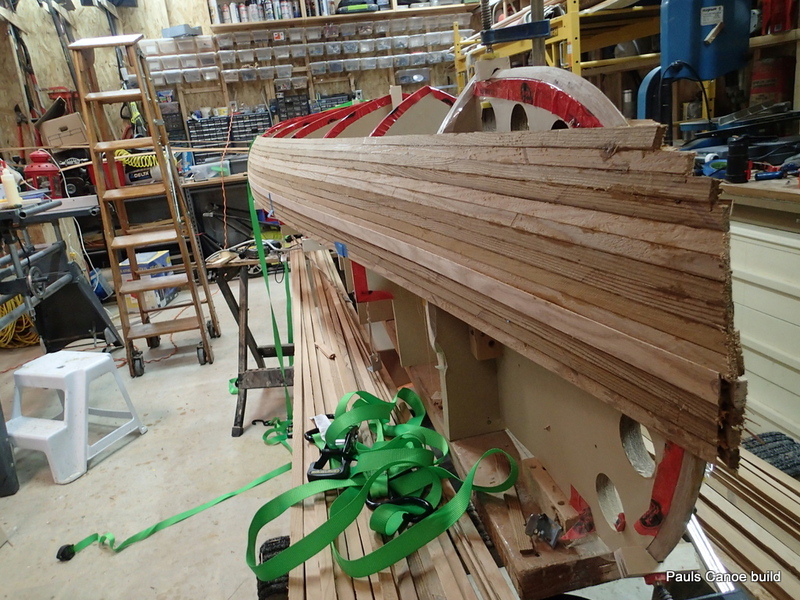 West side of the Canoe. 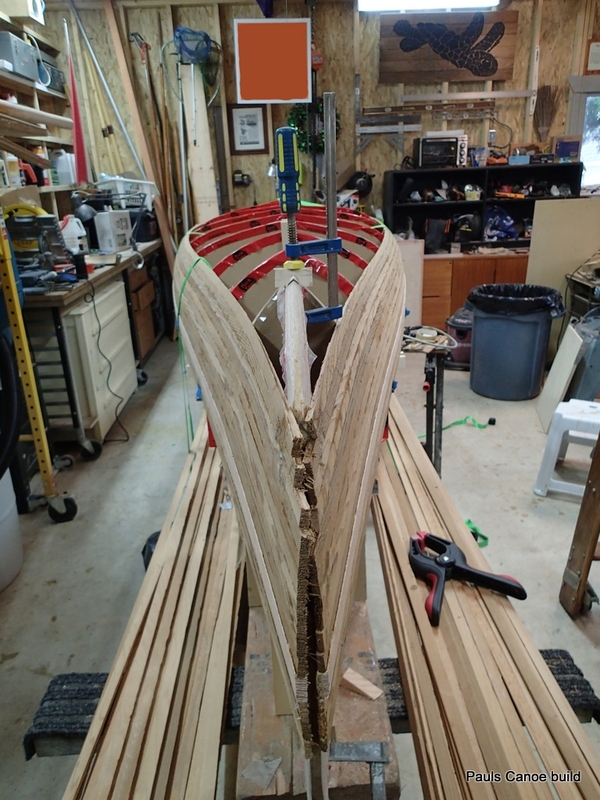 We are both pleased with how the canoe is taking shape, the curves look even from both ends. The next day we put on the Fifteenth Strip and then the Sixteenth trip later that evening. Clamps holding the stem-pieces on each end are now in the way . 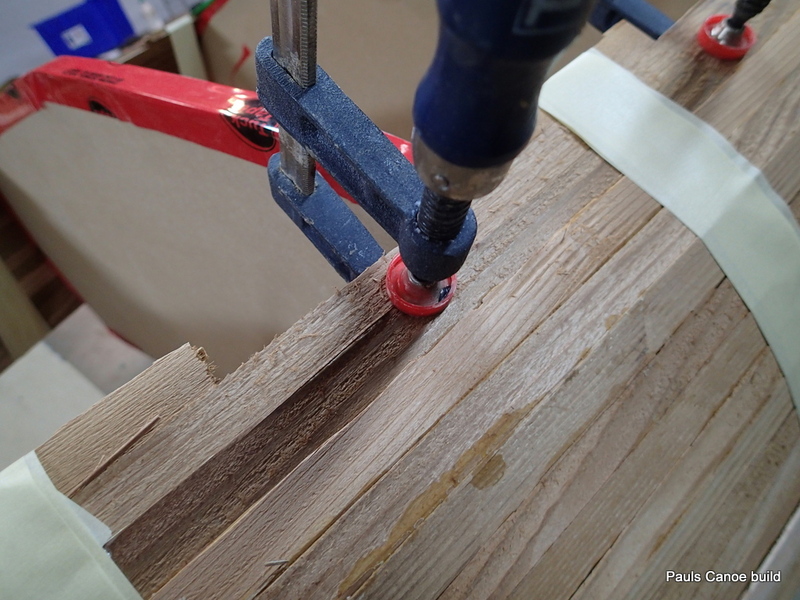 We have to remove the clamps holding the stem-pieces to fit the Seventeenth Strip. Painters tape to the rescue! Let us get that strip on! 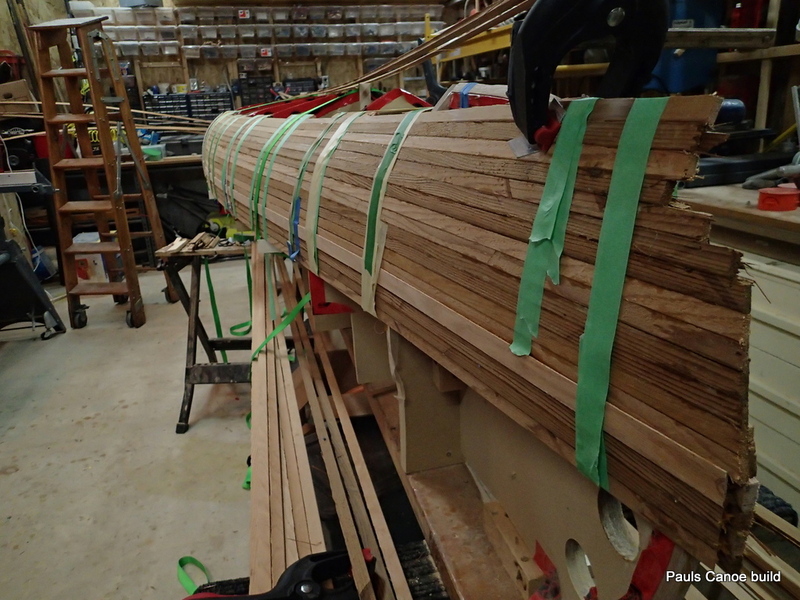 We apply glue to the cove and get the strips under the straps. 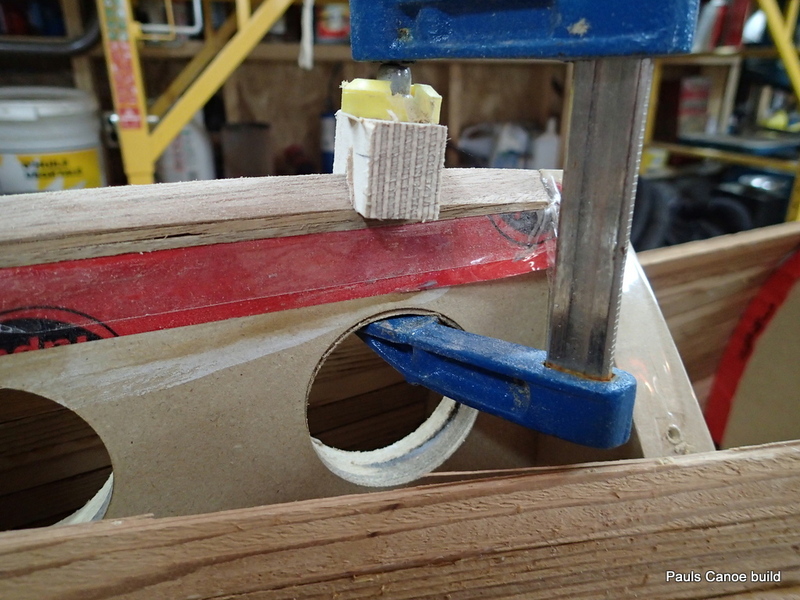 The squeeze clamps hold the strips temporary while we put the glue on. 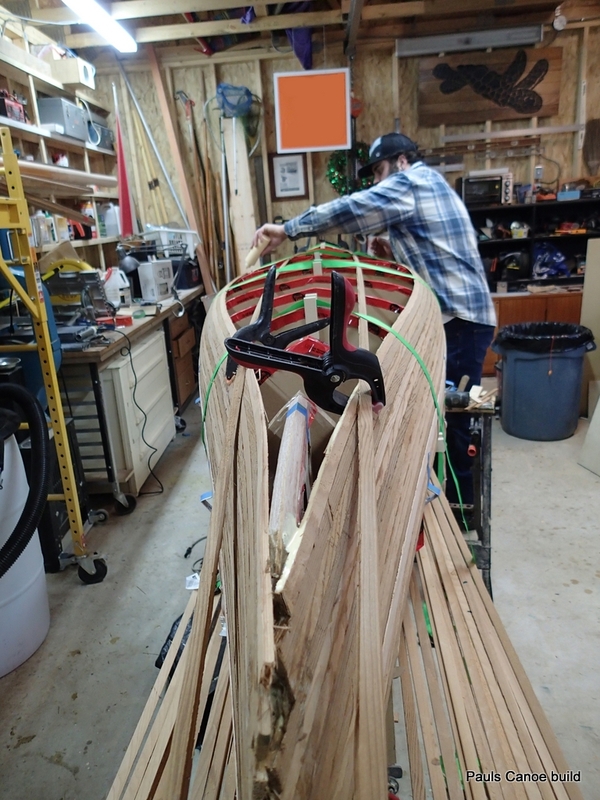 Paul putting glue in the “cove” of the strips. 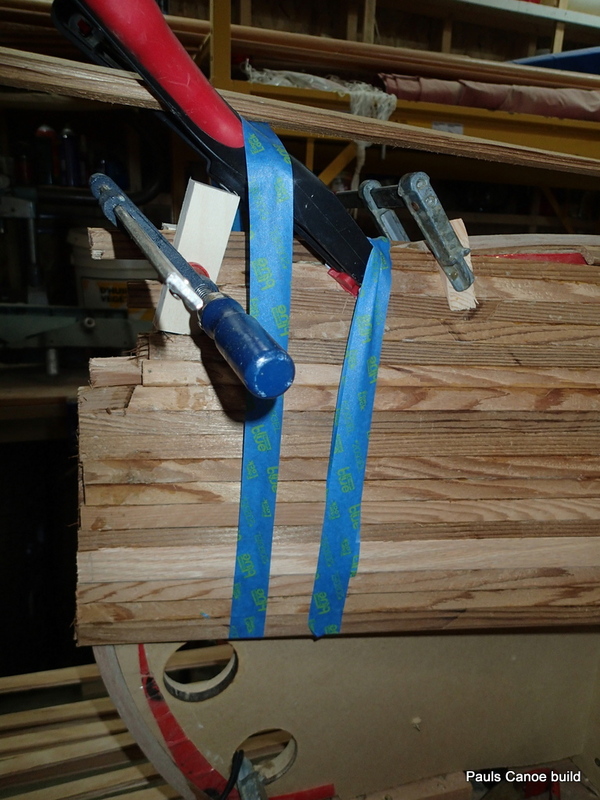 We use squeeze clamps to hold the strip while we tighten the straps from the centre outwards. 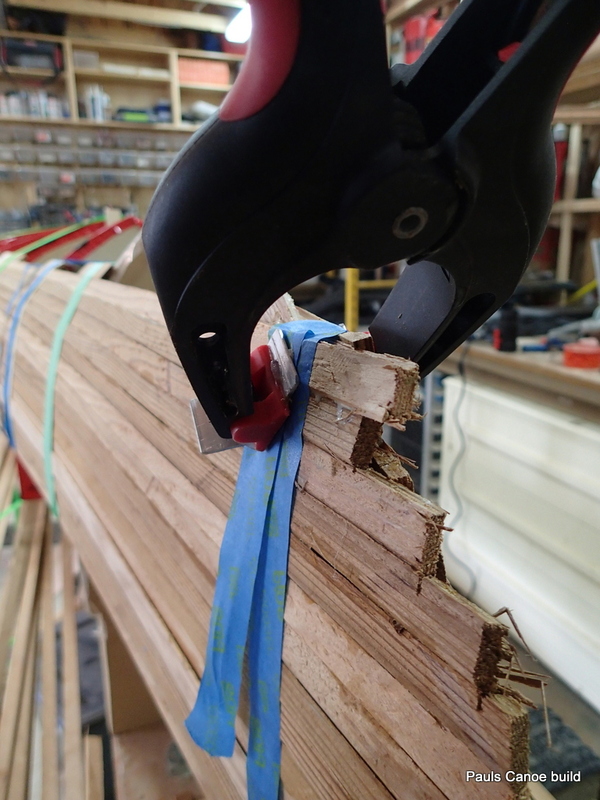 We are still having a hard time getting the stem squeeze clamps to stay in place while the glue sets. We start the strip at the stem-piece, clamp it temporarily, and then, from station #1, tighten the straps and push the new strip onto the one below it. We then go to station #4 and tighten that strap down while holding the new strip to the old one. 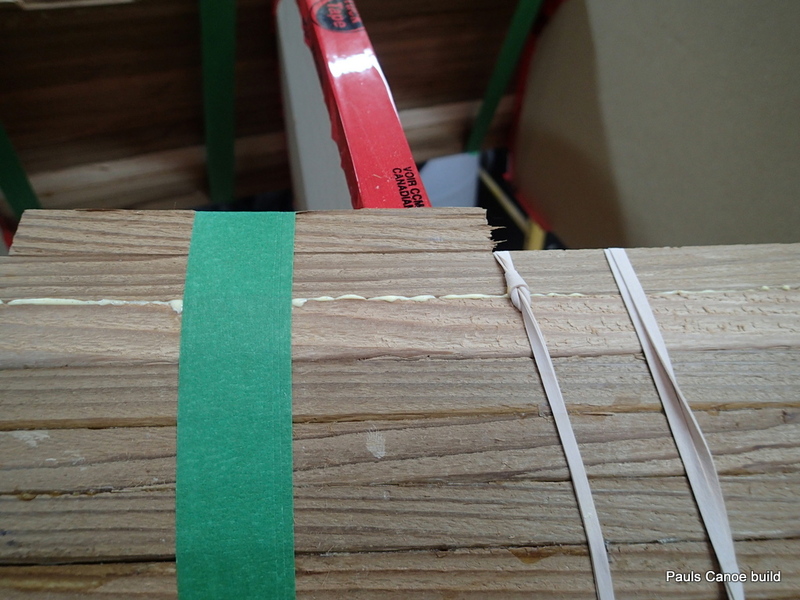 When all of the straps are tight, we begin taping, squeezing the new strip onto the old one and use tape to hold the strip to the one below it until the glue sets. 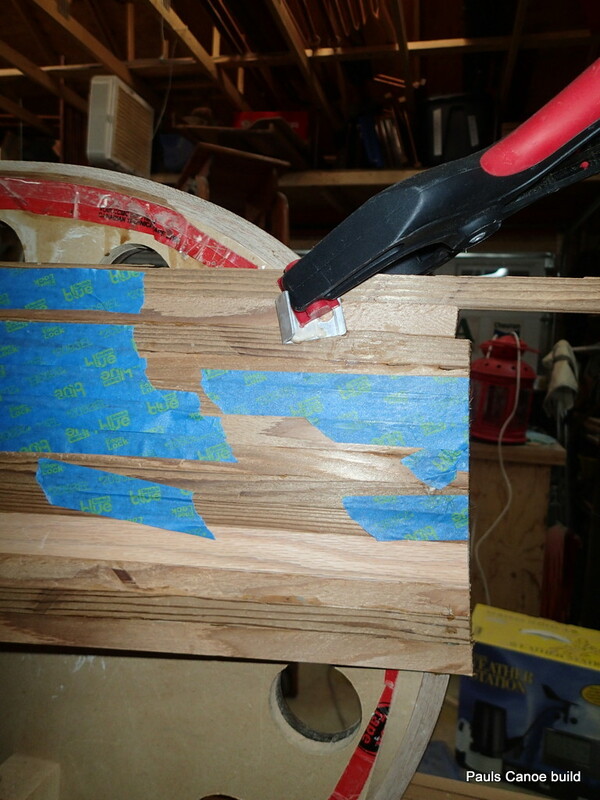 Glue squeezed out, tape holding the new strip onto the old one. We are using a lot of tape, but, I had a lot of left-over from painting the house. Might as well use them, as the tape does go “bad” over time. 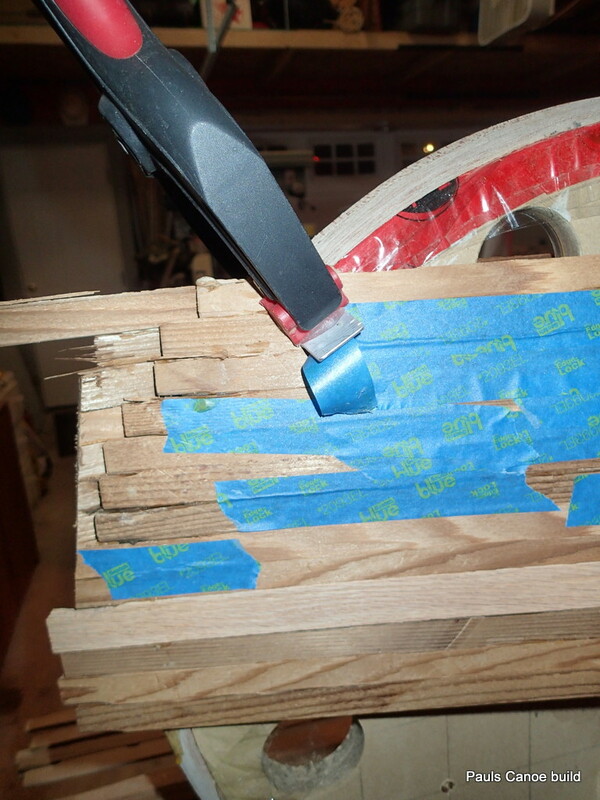 We are using a scrap piece of strip when taping so we do not crush the “cove” with the tape. 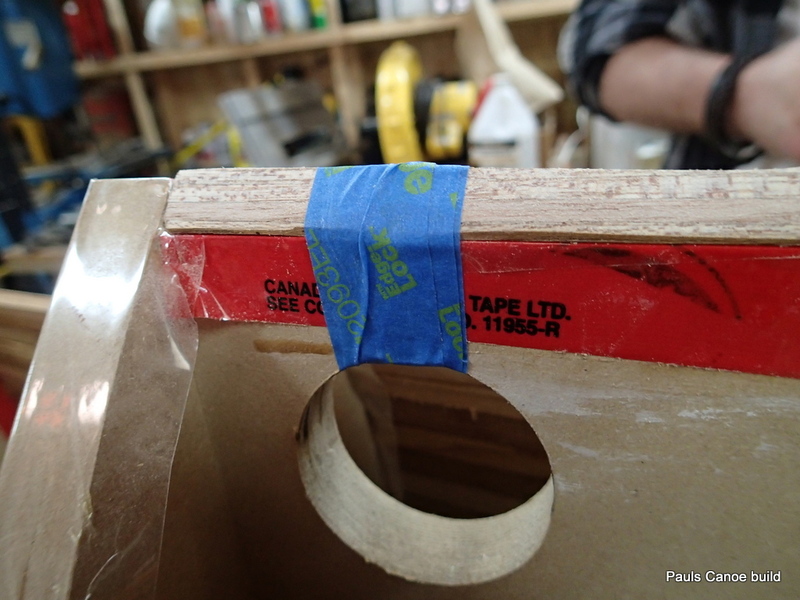 Painters tape used to keep the stem squeeze clamp from slipping, the strips together and pull the strip to the mould stations. Painters tape holding the squeeze clamp in place. Occasionally, the strip does not want to stay in the cove below it. 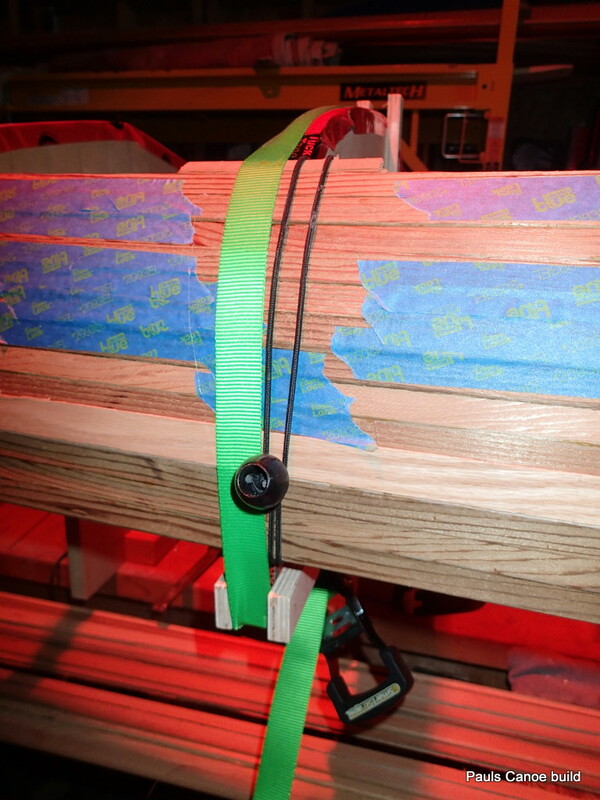 We use a clamp to keep the strips aligned. 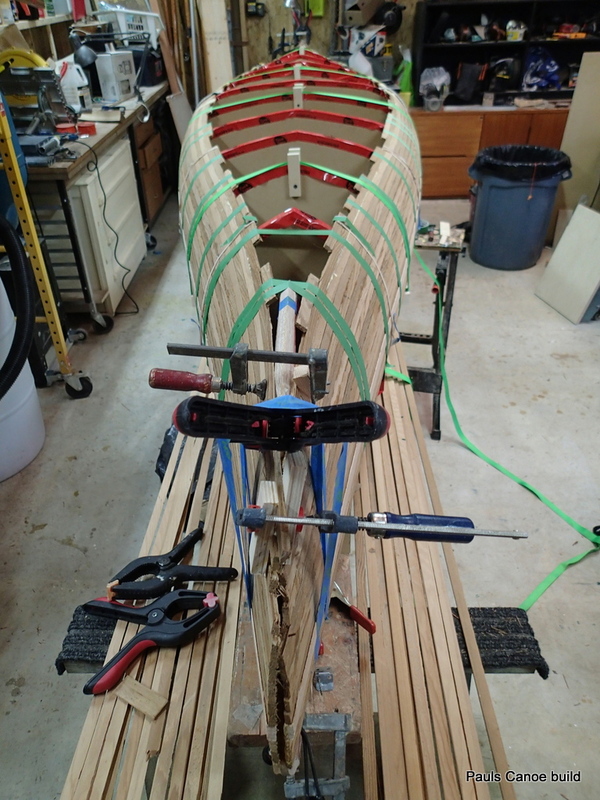 Seventeen Strip on the canoe, Fourteen Strips to go. Maybe two more on each side and then we will have to plank up one side at a time. Getting there slowly but surely. West side view, Seventeenth Strip all taped up. 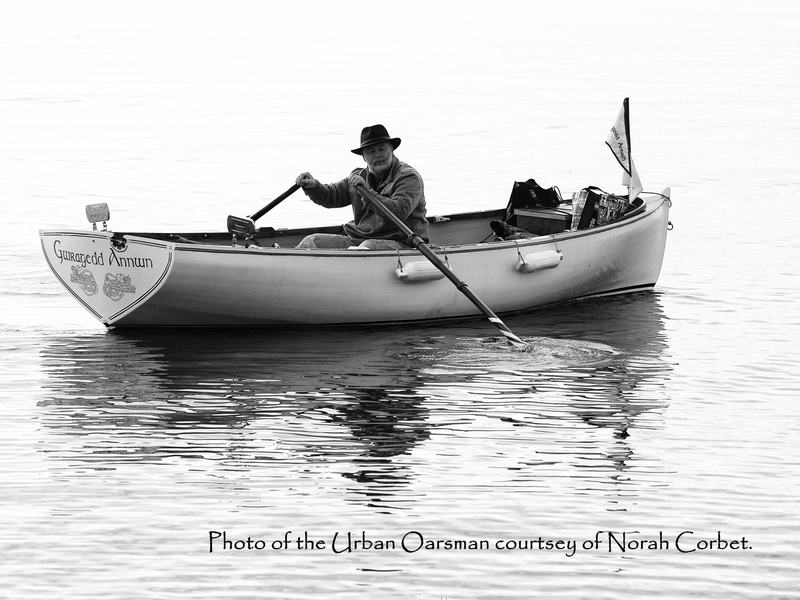 Paul’s Canoe, West side view.